I ahve enver tried cooking the fish beforehand in the microwave before. I either use tinned tuna or put the fish fillets in the oven for some time. WIll try your microwave methid next time. darun hoeche aar ja bolecho amader bariteo sabai football jwar e akranto. thats perfect for the game nites. WOOOW... this is so good. Nice recipe. Mouthwatering.... YUM! I have heard that Bengalis and Keralites are the only 2 states in India who love Football more than Cricket. Wonder why? My son loves Seafood more than anybody here at home. I must try Tilapia once. Love love the fish cutlets, they look absloutley delicous. And i love that jug/pot. This is the way my mom makes it, but last week, I decided to take an even shorter cut and just mixed raw ginger-garlic paste, onion and spices to the potato-fish mixture and made croquettes with them. I was afraid the raw garlic-ginger taste would come through but they tasted just fine. I would love to try THAT authentic Bengali chop some day. Love the fish chops. Not sure about Mardonna though. This looks so yum!! Must try..I have all the ingredients...i will make it right away..it will be a Mast snacks for my hubby who loves fish..
ami oi aloo coat kore chop banano chere dieychi..only once in a while. This is a perfect way - quick and easy and tastes as good. I like the use of the chutney. will do it next time. I have made your baked tuna chop several times and it is soooo good.Baked too! Must try this one soon. Maccher chop with football. Aar kee chai? I havent made maacher chop for such a long time. Tilapia diye bhalo taste hoye? I have always had/made with rui maach, you know like us Bongs. I will get some tilapia fillets and try yours. My mom does fish croquette with mackerel- those chop reminds her! So u guys are ardent lover of soccer? I was a huge fan when I lived in Europe probably the envir made me crazy! 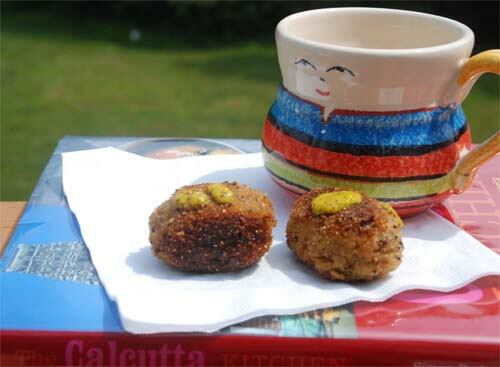 It was Jamai shoshti, i guess last week(thursday), My mom told me to prepare all good stuff, especially Maach for her Jamai... so tried these fish croquette..oh!!! they were awesome... my hubby loved it... Shob gulo kheye nilo..
Can this be baked instead of shallow fried? It sounds divine but I never end up making any fried items these days. I would bake tuna fish chops. Though the fried tastes better. Also experiment a bit with the coating for getting the perfect baked result. Bong Mom's recipe darun.....yuum! Dukkher ei je amader ekahne telebhaja bhalo paoya jayna. Ei blog-er boudi-ra, keu baniye pathiye debe bhai? Thanks a lot for this... I made it and came out awesome!! followed exactly what you did here.. kudos!!! hi didi.. ami kotodin ei chop ta store korte pari ba kibhbae store korbo ektu bolbe? can I store it in the freezer? You can freeze them after breading. Then fry them frozen as needed. Don't defrost. Ektu carefully fry korte hobe as you have to fry it frozen but it will take more time. First e low heat e kore tarpor heat bariye baireta try koro.